Yogi Berra is synonymous with the New York Yankees. He was arguably the life blood of the team for 18 seasons. But how many people realize that Yogi attempted a comeback of sorts for the New York Mets in 1965 at the age of 39? After ending his playing career with the Yankees in 1963, Berra went on to manage the Bronx Bombers in 1964. That year the Yanks won 99 games and took the AL Pennant, but lost the World Series to the St. Louis Cardinals in seven games. Following Berra's inexplicable firing after the '64 campaign, Berra became a coach for the Mets. Berra remained a coach for eight seasons, and was made manager in 1972 after the death of then manager Gil Hodges. During the 1965 season, Berra made a brief return to the diamond and appeared in four games for the New York Mets. Berra made two pinch hit appearances and played two complete games at catcher. 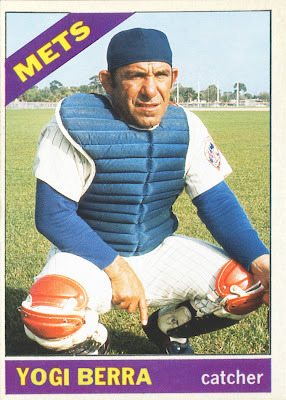 Berra only had nine plate appearances for the Mets, and got two base knocks in one of those four games. Although Berra's stats in 1965 were not really cumulative enough to earn a Topps card, I think given his stature in the game he should have been awarded one.